Hollywood is moving East! Media Lab creates Center for Future Storytelling. This is an exciting time for rethinking the idea of storytelling and how people and objects may engage in creating and sharing stories. Another aspect that is interesting is the mutation of story through different people, as a method to promote and distribute academic/intellectual creativity within our society. Plymouth Rock Studios will be there to foster the next generation of movie creation. This story made the New York Times and also the Boston Globe. My buddy Tad wrote a treatise on Ugly Design. Ugly is a subjective term for the anti-mainstream embodiments of products. However, I aspire to accomplish more than a physical, visceral appearance, and visual reaction to my work. My goal is creative experience design, where ugly could be explored because it elicits something new in our experience of interacting with the product. I propose to answer the activity theorists question "what is the context of the purposeful action", through creating new contexts and new experiences for the user/customer. Ugly is definitely a valid axis for design. Ugly in the visual sense could possess beauty in the other modalities, tactile and audio. Ugly can be beautiful if it is personalized. Ugly also embraces DIY culture, because the personal creation often possess an anti-professional aesthetic. Thanks to Tad for telling us "Ugly is the new 'cool kid'"
wedding in October in Miami. Looks like its a year of weddings. Jim and I just went to Lindsay and Dan's wedding last weekend in Methuen. The ceremony was followed by a gorgeous reception in Derry. There was a large robot turnout to celebrate the occasion. I just returned from a weekend of celebrating Joyce's recent engagement to Dan. We had a terrific dinner in South Beach, first at Tantra and then chilling at a lounge. The weather was perfect, and tropical storm made the weather exciting. The beach was wonderful, as always! It was nice meeting Joyce's friends, and also to hang out with her Dan, and my family as well. Everyone is very excited for the couple. I'm looking forward to the wedding in October. Happy Birthday to the coolest, most exciting Prof I know. We know what you'll be doing for the next two weeks...Wii! Jim and I started our clay class for the summer. It was fantastic to get our hands dirty again. My teacher, Marc, mentioned that he had been creating new whistles. I could not believe this one, it knocked my socks off. 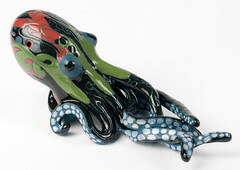 It looks like its moving, very seductively and the decoration is gorgeous! I think this one is quite large, so it probably has low melodic notes. I am looking forward to hearing this. WOW!!!! Jim & Rich riding Keegan's boat. Whee Har, Jim and Rich riding shotgun down the Dead River. I'm buried in the foam behind Rich. 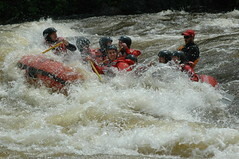 It was category 4 rapids, and the wetsuits were put into heavy use. I think we're ready for category 5! It was a long trip up to Maine, but the weather was good and sunny. Hot diggity dog! Congratulations MIT Class of 2008! Here are the stickmen 08 in their regalia. Picture taken by Sharmin K. Don't they look great? I'm going to do a lot of celebrating the rest of this year! A hearty congratulations to the 1 L, 2 J's & 3 D's I know who are getting married. Go Dan(s)!!! If you play Mastermind, then I think all the pegs are in the right spot. One on the Miami side, is my beautiful cousin (above). On the Boston side, a co-Robot. There's gonna be a lot of fancy dressing up when the robots go to town. Another coworker friend on the West Coast. at Stanford, is finally settling down. Congratulations All! This post brought to you by the letter D, J and L! Last weekend, Debbie hosted Gongke's baby shower. There were lovely treats and delicious delicacies. Many gifts were oooh-ed and ahh-ed at, and candy was consumed in copious amounts. Here are the pix of the lovely event. Afterward, Mrs. Shen, Gongke and the brothers (J, R, C), and I went to Penang to celebrate Mothers Day early. Final presentations are tonight for my Toy Design Class! I'm looking forward to seeing all the finished toys. I know my team, Emerald, has done a great job on their toy, so I know they will do well. :) It will be the exciting culmination to a semester of fun, hard work. -UPDATE! My team rocked the house! We got the top marks in all the categories they were reviewed. whoooT! I saw my twin on the Ponte Vecchio!